Dear all, look what we have found. 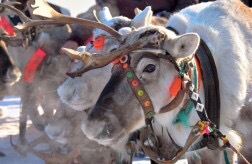 Lapland UK, a magical experience for the whole family to enjoy in the time leading up to Christmas. In Ascot just outside of London. We interviewed Alison Battle (the owner) to find out more…. RM: Can you tell us about the people behind LaplandUK? AB: LaplandUK is a family owned business which was founded by my husband, Mike and myself in 2007. It was born out of our personal sadness and frustration at the lack of magical, high quality Father Christmas experiences available to families in the UK when we first started venturing into the world of Father Christmas visits with our 4 young sons. Not being able to find a magical experience to celebrate the joys of childhood innocence and traditional Christmas values in a charming and authentic way for those few precious but fleeting years in a family’s life when children wholly believe in Father Christmas, we decided to do something about it ourselves so gave up our careers as a London primary school teacher and hedge fund trader to create our own immersive theatrical interpretation of the Father Christmas myth which is built from new every winter in a pine forest on the Windsor Estate. RM: What makes LaplandUK a magical experience? AB: What makes LaplandUK such a magical experience is the dedicated team of professionals who work all year to ensure we deliver an experience of exceptional quality and detail. 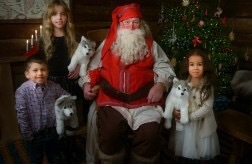 The personalisation of every child’s visit makes it a believable, bespoke and therefore magical experience for each family, from the wax sealed personalised invitation that drops through each child’s letter box, to the tailor made meeting with Father Christmas, who knows details about each child’s life. Parents love the authenticity of LaplandUK, exactly as you would dream the pine forest homeland of Father Christmas to be- you won’t find any branding or advertising, not even a cash machine (though you will find elf currency- the Elf jingle!). We were absolutely thrilled that our passion for this subject was recently recognised by winning the Little London award Best Family Day Out 2015 accolade. RM: What’s your favourite part of the experience? 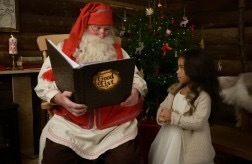 AB: While the magical meeting with Father Christmas in his snowy log cabin home is the highlight for families, there is something very special indeed about the moment when the huge magical door to LaplandUK groans open and you are transported from a British forest scene to a snowy arctic wonderland. RM: Can you give us a small insight to a day at LaplandUK? AB: Every day at LaplandUK is special as new families arrive full of excitement for the day ahead. Our team arrive early in the morning and we start the day with a briefing over coffee and croissants to ensure we are all informed of the day ahead. The first visitors arrive at 8.30 am, ready for the opening tour of the day at 9am. Each tour lasts 3.5 hours during which families visit the enchanted forest and meet the forest elves who teach them how to journey to LaplandUK, build toys with the elves in Father Christmas’ Toy Factory, decorate gingerbread in Mother Christmas’ kitchen and listen to a traditional story, go ice skating, meet husky dogs and reindeer, have fun in the Elf Village and of course, meet Father Christmas in his snowy woodland home. Tours depart every half hour until 5pm so there is a constant buzz of excitement throughout the day. The energy levels of the cast is incredible, it really is the happiest place you could wish to be. The last visitors leave by 9pm. After a late supper, our team debrief the day and head off to bed by 10pm. RM: The elf workshop sounds magical, what does this involve? AB: The Toy Factory is where all the toys for the good Small Folk are made! The head elf in the Toy Factory is called Headcorn, who is assisted by his trusty factory elves, Conker and Wish. It is Wish’s job to ensure all the wishes of the Small Folk come true at Christmas. Conker is a playful, young elf who has not yet passed elf training to be awarded the golden bell to sew on to his hat by Father Christmas! Every child has their own work station in the Toy Factory and builds two toys under the guidance of Headcorn, Conker and Wish. What they are this year is a secret! RM: Are there any extra activities you can do on the day? AB: During the tour, families enjoy 90 minutes of free time in the Elf Village. This is the time to visit the Lapland Post Office and write a letter to Father Christmas, meet the Elf Blacksmith, Ambolt in his forge, or Pixie Mixie in the Elf sweet shop, spend Elf Jingles in the Elf emporium or enjoy a tasty treat in the Elf restaurant. RM: Tell us about the food available at LaplandUK? AB: There is a log cabin Elf Restaurant at LaplandUK that serves delicious winter warmers such as Christmas pie and mash, nordic meatballs with lingonberry sauce or fish finger sandwiches, all served on elfish wooden plates! For a lighter snack, European style sausages or toasties are available as take away options while watching the ice skating, all washed down with a mulled wine or creamy hot chocolate. We are thrilled to have supported many children’s charities over the years. This year we are working with Rays of Sunshine, a charity that supports children with life limiting illnesses. We will be hosting a Gala evening on 2nd December, all ticket sales for which will be donated to Rays of Sunshine.